Custom Large Pill Boxes Personalized in bulk. Promotional, Cheap, 6 Compartments. 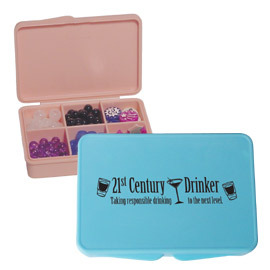 Personalized large pill boxes, 6 compartments custom printed in bulk. Promotional, Inexpensive. Bulk custom imprinted pill boxes at the Budget Prices in the USA and Canada. American clients pay no taxes. Six compartments under one lid. Large imprint area. We also supply wholesale blank (not imprinted) pill boxes at the NQP (Next Quantity Pricing: use the pricing for the next quantity to the right). Free artwork design. We will send you a proof for your approval before production. Two or more imprint colors: add $39.00 set-up charge per each extra color, plus $0.10 per item, per color. Optional exact PMS imprint color: $40.00. Exact color matches cannot be guaranteed on non-white product. Production Time : 7-10 business days from artwork approval. Contact us for faster delivery. Blank pill boxes ship next day. Size : 2-1/2" x 3-3/8" x 7/8"
Imprint Area : 1-1/2" x 2-1/2"
Imprinting : Prices reflect 1 standard color in 1 location.